BERLIN, Aug. 31, 2017 — (PRNewswire) — XYZprinting, the world's leading 3D printer manufacturer, is poised to usher in a new era of full-color 3D printing with the da Vinci Color – the world's first full-color 3D printer that uses 3DColorJet technology – combining inkjet printing with the fused filament fabrication (FFF) 3D printing process. Announced at IFA 2017, the da Vinci Color (MSRP $3499.95) is available now for preorder on the XYZprinting e-store for USD $2,999.95. XYZprinting's da Vinci Color will be on display at IFA 2017, September 1 – September 6, at the Berlin Exhibition Grounds, Hall 13 Booth 102, Messedamm, Berlin. 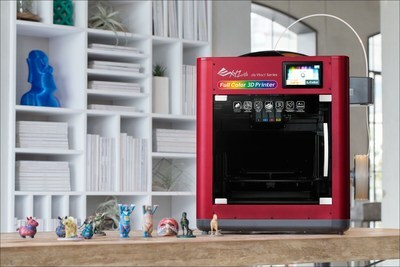 "With its 3DColorJet technology, the da Vinci Color is a breakthrough in 3D printing technology as it provides full color spectrum accuracy at an affordable, small business-friendly price, that is unmatched by any other color 3D printer in the market," explained Simon Shen, CEO of XYZprinting. "Just as we did with the da Vinci 1.0 in 2014, the da Vinci Color is poised to change the 3D printing industry again and allow you to turn your creativity into color 3D." The industry's ultimate full-color 3D printer, XYZprinting's 3DColorJet solution enables the da Vinci Color to mix and fire CMYK color droplets onto PLA filament for accuracy and precision. The printer's technology achieves the full-color spectrum of 16 million color possibilities across printed layers in finished 3D products. The proprietary technology combines color detail, which has been perfected in inkjet printing, with advanced, professional 3D printing technology. A CES 2017 Innovation Award Honoree, the da Vinci Color has been designed to work seamlessly, including features such as XYZprinting's hands-free auto calibration, EZ removable print bed and a 5-inch color LCD screen. XYZprinting's CMYK ink cartridges integrate with the da Vinci Color and guarantee compatibility and color quality for each print. While the print bed permits a generous 7.9 in. x 7.9 in. x 5.9 in. build volume, the design remains a desk friendly solution. With safety in mind, the printer also includes an effective non-toxic filtration system. Animation and Movie Models: Produce prototypes in true color that are ready to be used immediately after printing. Create accurate detailed props and sets. Architects and Designers: Assist clients envision the final product by printing out scaled down models, miniature landscaping, people, prototypes and more. Small Business Owners: A cost-effective solution, small business owners can set their business apart or even start their own full color 3D printing business. Further, benefits include increased speed of production through full color prints, which are immediately ready/ With PLA filament, there will be no wasted time or money on post printing treatments. Education: Incorporate full color 3D printing into classrooms, spurring everyone from young creators to higher education curriculums. Fans and Collectors: Print out your favorite Warhammer, comic book, pop-culture or fantasy universe characters in their authentic full colors, or create custom, one-of a-kind designs!